Teeth whitening is a popular cosmetic dentistry procedure in Provo and throughout the state. Numerous ads for whitening products in our local Provo media contain terms such as ‘white brite’, ’22 carbamide peroxide’ and ‘peroxide teeth’. They look tempting, but how do you separate tooth bleaching fact from fiction? First, and especially for our local Provo patients, we recommend talking to Drs. 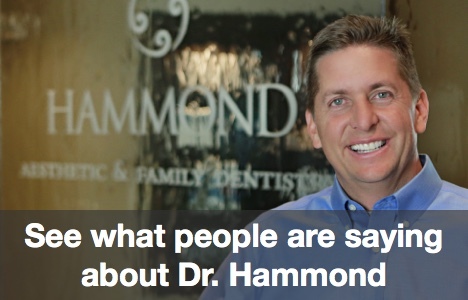 Hammond DMD at Hammond Aesthetic & General Dentistry. Just because teeth whitening products are readily available in Provo, it doesn’t mean they are all safe or appropriate for every person. Getting a professional opinion is a good first step. Don’t be fooled by smile whitening hype and risk damage, especially if you need tetracycline teeth whitening. If you have existing cosmetic dental work such as dental crowns, bonding, partial dentures or bridge work, it is especially important to talk to a Provo dental professional about worry free dentistry teeth whitening. Teeth whitening kits are not the only way to quickly improve your smile in Provo. Many of your neighbors have benefited from porcelain veneers. There are several brands of veneers such as Lumineers by Cerinate, da Vinci and Mac. We can help you decide on which is best for you. Porcelain veneers can also fix chipped teeth and cover stains. The vast majority of Provo veneer recipients are extremely pleased with the results. Providing comprehensive dental care for Provo families since 1996.